Ang Lee’s vision of Yann Martel’s 2001 novel, ‘Life of Pi’ is one of the most visually beautiful films I have seen in a long time. If this film was made back when the book came out, which was over ten years ago, the movie would not have been as beautiful as it was today, due to the technology advancements we’ve had in just ten short years. 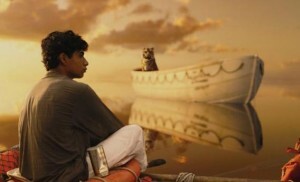 ‘Life of Pi’ is one of the better 3D productions I have seen and if you choose to see this movie, see it in 3D. 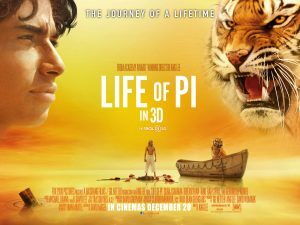 ‘Life of Pi’ will appeal to all audiences and you will find yourself falling in love with Pi and a majestic Bengal tiger, even if ‘Life of Pi’ is good for only one or two viewings. 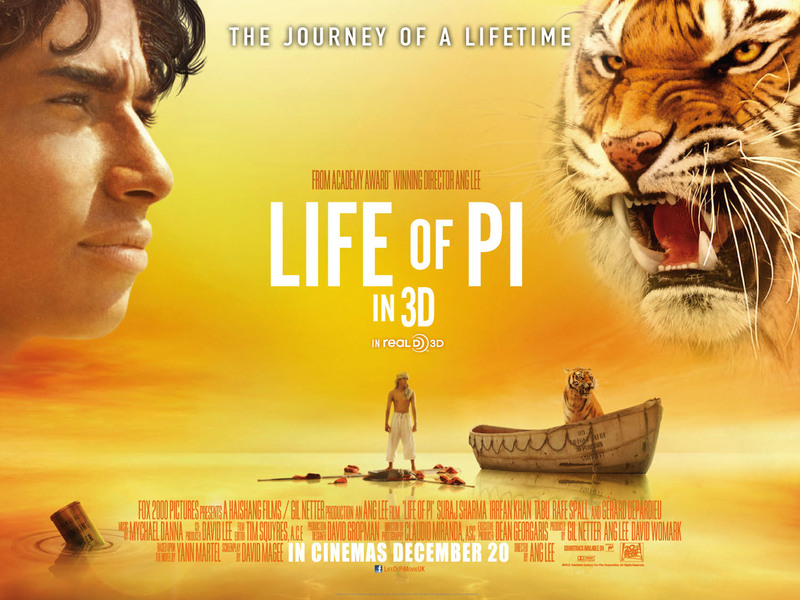 The first act of ‘Life of Pi’ follows a family in Southern India known as the Patels. The youngest of this family of five is Pi Patel, whose dad owns a zoo and is part of a warm loving family. Pi goes through grade school mostly ridiculed by his name where the kids call him Piss, but when Pi actually writes out the numerical Pi across several blackboards, Pi gains an ounce of respect, but not much in school. We see Pi wonder about many things in life, as he takes an active role in asking all the major questions growing up questioning life and death and good and evil. By the age of 12, Pi has taken on three different religions, Hinduism, Christianity, and Islam. Even his family ridicule him about him following three religions at the same time saying that if he adds one more religion, he will have every day off of work for the rest of his life. We even see Pi grown into a teenager and fins his first love, but as those hard economic times rush in, Pi’s dad decides to move the family to Canada and sell the animals in hopes of starting a new business. In the middle of their journey at sea, a vicious storm moves into the ship’s path and damages the ship enough for it to sink in the middle of the ocean leaving only one survivor, Pi. After the storm, Pi is in the middle of the ocean on a very small life boat, where he realizes that an injured zebra got on board from the ship during the storm. Come to find out, a hyena, a rat, and smart orangutang also got on board the tiny life boat with an addition of a tiger who hides out under the tiny life boat’s tarp. 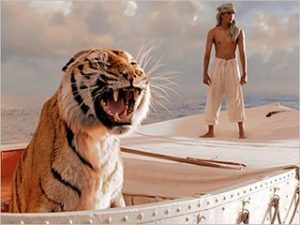 The current dire situation and nature take it’s almost immediate toll, and there are only two left on the boat, Pi and the tiger who goes by the name of Richard Parker. Pi and Richard Parker at stranded at sea for almost 8 months. In that time, Pi learns to attain food for himself and Richard Parker, and all the while keeping a safe distance from this large cat. They also get a glimpse of the wold life at sea, witnessing a horde of flying fish, a giant whale, millions of glowing jellyfish, a mysterious island, and a second ferocious storm that might be just too much for Richard Parker and Pi. As we find out in the first scene of the film as well as the last scene in the film, this amazing adventure story is being told to us by and middle aged Pi, who is sharing his story with a writer, who questions his story. The adult Pi goes into explicit detail, spelling things out for this writer on what actually happened, and letting him decide for himself what he wants to believe. Ang Lee did a phenomenal job of making this epic tall tale seem very realistic. The use of real animals and special effects are astounding. The film was made to be seen on the big screen. The visual FX team tuned this creature to such a fine detail, that you won’t think for a minute that this Tiger was fake. The other amazing thing about this film is Suraj Sharma, the teenage version of Pi, who is through most of the film. This is Sharma’s first role, and man was it impressive. He hit all the right emotional notes in the film, and you really care for him early on. All this being said, this is a fairly heavy and epic film. A film that is very beautiful on every level with a great cast that impresses. But, I found myself not wanting to revisit this film. Sure I want to see how it looks on blu-ray, but to me, this does not have a replay factor whatsoever. May it be the subject matter, or the huge reveals that you can’t forget, and will hinder your future viewing experiences. But, rest assured, this is a fantastic film and should be seen on the big screen at least once. Blu-Ray Review: ”Life of Pi’!!! Hellboy (2019) – Film Review! ‘Pet Sematary (2019) – Film Review! This entry was posted on Sunday, November 25th, 2012 at 3:09 pm	and is filed under Film, News. You can follow any responses to this entry through the RSS 2.0 feed. You can skip to the end and leave a response. Pinging is currently not allowed. « Geek Deal of the Day! Bond 50: The Complete 22 Film Collection Blu-ray!!! Only $99.99!!! Take THIS under advisement, jerkweed!